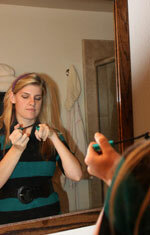 Try placing velcro on the bottom of eyeshadow and other makeup containers. Place the other velcro piece somewhere on your bathroom counter. This will keep the makeup case from sliding around while you’re applying makeup. There are a number of magnetic jewelry fasteners on the market.